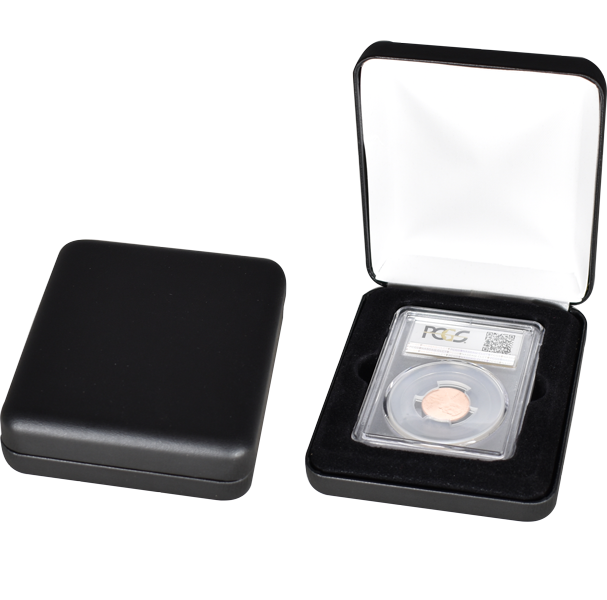 Made in the USA, these sturdy metal shell Guardhouse slab boxes box will accommodate NGC and PCGS slabs and make the perfect packaging or gift box the collectors. Each box comes with an external white sleeve and is hand wrapped in a velour, velvet or leatherette material of your choice. The interior base of the box features a flocked vacuum form insert, with a flocking color matching the exterior wrap. On the inside lid, a white die cut puff provides a final finishing touch to the box. Guardhouse metal shell boxes are also available with other custom features, including silver and gold rims, ribbons for certifications, and even printing on the interior puff or top of lid (leatherette style only). Minimums apply to most customizations. Please call for more details.